Recently, I have been telling everybody I know about the Maumee River. 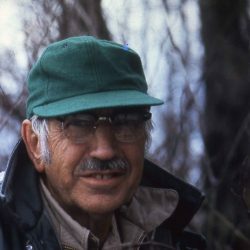 Among the first things I usually mention are that it sits at the center of the largest watershed in the Great Lakes region, that it drains more than 6,600 square miles of land in Indiana, Ohio, and Michigan, and that it has a lot to do with the rafts of cyanobacteria that have been producing ”dead zones” in the western basin of Lake Erie. If they are still listening, I add from there. Depending on who you ask, these questions and answers have been going on for a couple years now. My interest in the Maumee River is largely genealogical. I was born in Fort Wayne, the city of three rivers, established at the place where the St. Joseph and St. Marys come together to form the Maumee. In the fall of 2013, my wife and I moved into the upstairs of a house on Columbia Avenue, along the Maumee near the junction of the three rivers. The proximity got to me. I started reading a lot about the river—local histories, news coverage, EPA reports—and didn’t stop. I had started to wonder: What does the river know? Still chasing that question in the late summer of 2016, I traveled from one end of the Maumee River to the other. The trip took eight days. I walked most of the way. At night I camped in backyards or on riverbanks, or slept in the spare bedroom of relatives. In Defiance, Ohio, I stayed at a bed and breakfast. For two days I paddled with a friend of mine in his canoe. I kept a notebook of the journey, collecting observations and ideas that, together with a pile of research, became a book called In the Watershed: A Journey Down the Maumee River. When I talk with people about that trip, they often ask some variation of “So, what did you learn?” It’s not an easy question to answer. 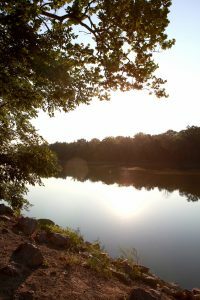 I learned the sound of ripples surfing river bottom at the Maumee River Overlook, and how cyanobacteria blooms across the surface of a body of water. I learned the terms and conditions of a watershed, and the consequences of eliminating a million-acre swamp. I learned a thousand other things, too, most of which I probably do not yet recognize. 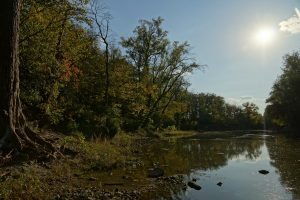 The Maumee has become, for me, a way of understanding the history, culture, and ecology of this region. It has influenced and been influenced by, among other things, glacial formation, Native communities, European invasion and settlement, transformation of wetlands, agricultural development, industrialization and recreation. Studying the Maumee, I have come to better know my place—and my place within it. The novelist Iain Sinclair has called rivers “ribbons of memory” in an age of cultural amnesia. In them we see a history of our tenure in this land, and a reflection of our present. 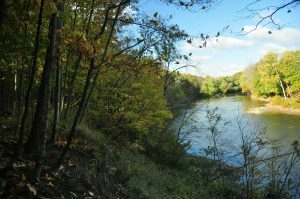 The Maumee is a long-standing member of the region, bearing in its course the accumulated wisdom of thousands of years. Maybe the river can teach us how to live in this world. It remembers, even as we forget. Ryan Schnurr is a writer and sometimes poet from northeast Indiana. His first book of nonfiction, In The Watershed: A Journey Down the Maumee River, is now available from Belt Publishing. 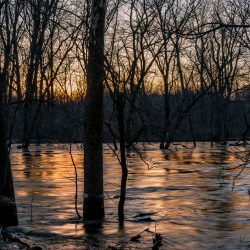 *Portions of this essay are adapted from “Seeing the Maumee River,” first published by the author in Old Northwest Review. 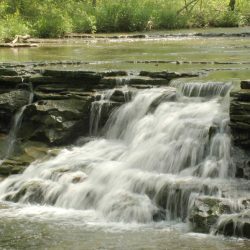 You’re invited for a Walk and Talk with Ryan, 2 pm, Sunday, February 18, on the trails of Blue Cast Springs along the Maumee River.